Autotrader is full of old Land Rovers -- and these are some of the coolest. Did you know this was supposed to be a Ford Probe? If you've been shopping for a new car lately, you may have noticed how many models have bigger wheels and a larger tire size. A bigger wheel/tire combo not only looks cool, it reduces the tire's sidewall height. The sidewall is the part of the tire between the inside diameter (where the tire meets the wheel) and the outside diameter (where the tire meets the pavement). The more sidewall you have, the more cushion there is between you and the road. Many cars with 18-, 19- and 20-inch wheels have very narrow sidewalls. This design vastly improves handling but tends to deliver a rather harsh ride. Conversely, handling is diminished when tires have tall sidewalls because there is more chance for excessive lean and roll (picture jogging in a nice pair of running shoes versus high heels). Thankfully, there is a good middle ground between ride comfort and performance, and it all comes down to wheel size. Whether you're in the market for a less aggressive ride or you already own a car and want to soften your setup, here are a few tips that can help. Many cars offer numerous trim levels. Base models usually have the smallest tire/wheel combo, while top-of-the-line trims often see an increase in wheel size. Many times, a sport package option will increase both tire size and the suspension's stiffness. If you're not an enthusiast driver, you'll probably be happier with the stock setup. If the trim you like comes with bigger wheels and you don't like the ride, you can usually ask the dealer to equip the car with different wheels; he'll know which wheels will fit and which won't. Keep in mind that Original Equipment Manufacturer (OEM) wheels will be far more expensive than most aftermarket wheels. Not all tires are created equal. Performance tires are usually made with softer compounds that increase traction but also increase road noise and reduce tire life. A touring tire is designed for the way most of us drive our cars, namely on highways and open roads at speeds no greater than 75 to 80 miles per hour. Touring tires ride a bit softer, last much longer and can even help improve fuel economy. If you already own your car, you can buy an aftermarket wheel and tire package that will help improve ride comfort. When changing the car's original wheels and tires, the general rule of thumb is that you can go up or down by one inch. For example, if your car is currently riding on 17-in wheels, you can reduce the size to 16 inches. 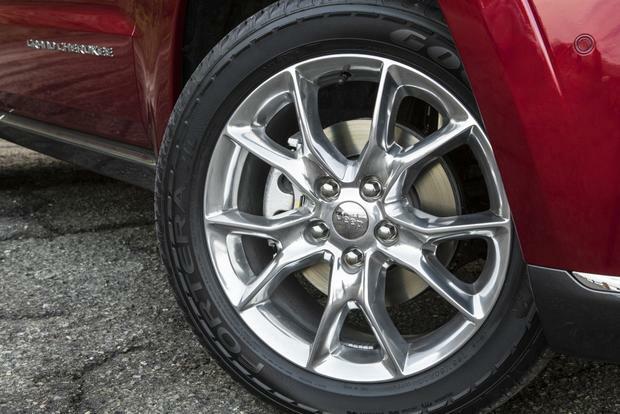 If you're looking for better handling, you can go up to an 18-in wheel. It's not recommended that you go much more than plus or minus one inch, as the car's suspension and springs were designed around the original wheel/tire setup. Too radical a change may lead to handling issues as well as suspension damage. Similarly, many brake calipers and rotors are designed with very little clearance between the components and the wheel. Trying to move from, say, an 18-in wheel to a 16- or 15-in wheel probably won't work, as the wheel won't fit over the brakes. If you want to change your car's wheel size, there are a number of resources that can help. Tirerack.com has an excellent tire and wheel fitment tool that not only lists which wheels and tires fit specific cars but also shows how your car will look wearing the wheels you've selected.